I hope so far your week as been fabulous! Today I am combining stamps from two different companies. I've noticed that paint and artistry are big themes right now. Many companies are showing brushstrokes and related sentiments. I wanted to showcase a few for you. 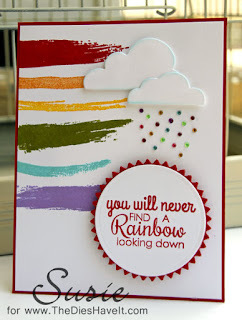 My sentiment is from Reverse Confetti and I am linking up to their weekly challenge today. My brushstrokes are from a new set by My Favorite Things. I am wildly in love with this set! 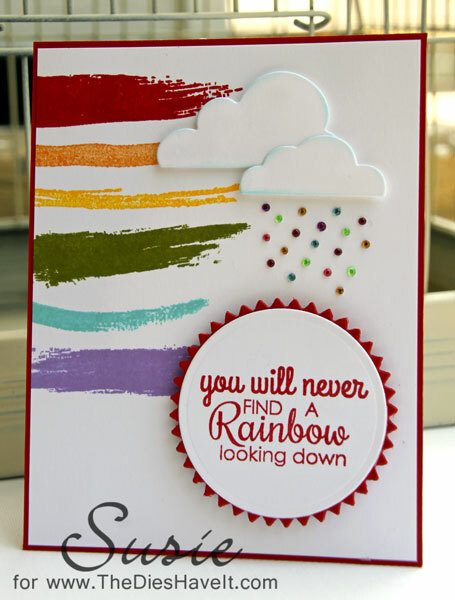 Once I made my card, I thought it needed more, so I added some die cut clouds (also from MFT Stamps). And THEN came my idea for rain made from colored bling. I think the rain just made the card!! So carry on with your week....and make it a good one! love all the colored rain from he cloud. great combo of stamps with that new MFT set.